Easy to Open, Close & Carry! 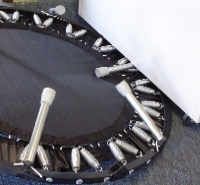 The great advantage to a folding rebounder is much greater ease in storing and transporting. The hinges are very strong and have been thoroughly tested for durability and stability. 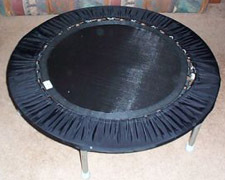 The rebounder's spring cover is made of a sturdy nylon/canvas style fabric and has Velcro strings attached at each hinge area. Before closing (i.e. 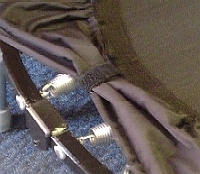 folding up) the half-fold unit, just wrap each Velcro string around the spring cover to pull it away from the hinge. The unit will arrive from the factory with the spring cover pulled away from the hinges. To Open: Firmly grasp both halves of the frame at the midpoint of each half circle. Please keep all fingers away from hinge area when opening. Using steady pressure, with hands open and fingers extended, use the palm of the hands to push top side of frame down and open. 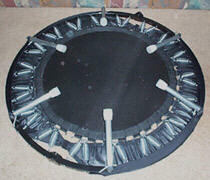 Note: The mat springs may cause the rebounder to snap open. With the rebounder now open and still upside down, lift each leg into a perpendicular position (up and over it's platform pin). 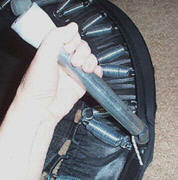 Make sure the spring cover and bungee cord are free from the leg tube so the leg seats properly. The six legs should be perpendicular to the rebounder frame and shouldsit solidly on the frame. 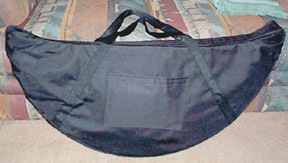 Turn the rebounder right side up, release the "Velcro holding straps" on the spring cover. 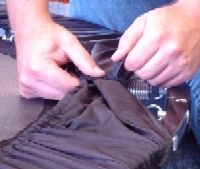 Pull that portion of the spring cover evenly over the hinge area. Pull the spring cover back away from the hinges. 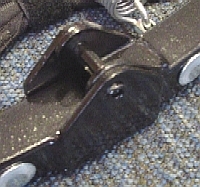 Fasten Velcro straps to hold spring cover away from hinge. Turn the rebounder upside down and lay flat. Pull each leg up and over it's platform pin and lay it down towards the center of the mat. Note: Extend the leg spring only enough to allow it to slip up and over the platform pin. Determine the bottom half of the frame by locating the side that has the larger/outer hinges. There are 2 accepted methods to close the frame. The traditional method requires more upper body strength and is easier for people with a short torso length. The Alternate method requires a couch or other piece of heavy furniture to complete. "Traditional" and "Alternate" closing methods are found below. Position your knees and hands on the frame as demonstrated. 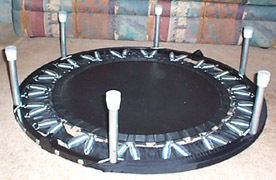 Note: The rebounder is held in the open position by the stout tension of the springs. 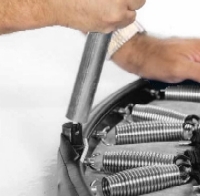 To close, you will need to overcome the tension of the springs. 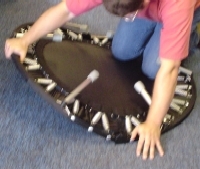 Once you have overcome the tension, the rebounder will have the tendency to snap closed. Make sure you grasp the frame firmly and pull slowly to maintain control while closing. Also, keep your head clear of the frame movement. With your right hand, firmly grasp the center of the "top half" of the frame and pull upwards and toward the "bottom half." 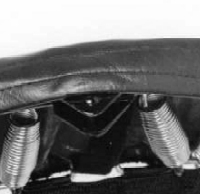 Having completed the steps above and determined the "top half" and "bottom half" of the hinge (see above), firmly grasp the "bottom half" at the midpoint of the frame with both hands. 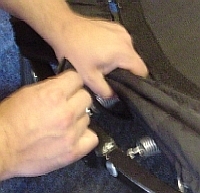 Slide the "top half" of the frame under a couch or other low and heavy piece of furniture. The frame and at least 1 leg will contact the furniture in this maneuver and may scratch the finish or fabric. It may be advisable to place a towel between the rebounder and the furniture. Raise the "bottom half" of the frame slowly until the spring tension is overcome. 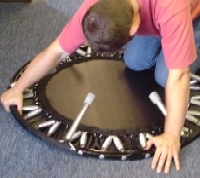 Slide the rebounder out from under the furniture and complete the close.